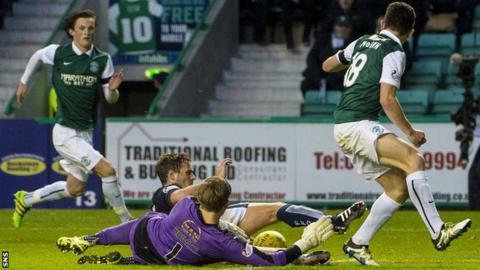 Hibernian head coach Alan Stubbs said referee Alan Muir got a "huge call" wrong in denying his side a penalty in their Premiership play-off semi-final first leg. With Hibs leading 2-1, Falkirk's David McCracken handled the ball in his own box, with Muir in close attendance, but was not punished. The match ended 2-2. "We want officials to get the big calls right," Stubbs told BBC Scotland. "Unfortunately, tonight, he's sadly, sadly got a big call wrong." The Hibees had trailed to Lee Miller's deflected goal but scored through Liam Henderson and Darren McGregor to lead after the break. After sliding in to make a challenge on John McGinn, McCracken rolled the ball with his hand as he stood up, before clearing it. Play continued and, in the final 10 minutes, Conrad Logan in the Hibs goal allowed Bob McHugh's shot to squirm underneath him for a late equaliser. "When the officials make such a catastrophic mistake, at such an important time in the game - 3-1 takes the real stuffing out of them," continued Stubbs. "At 2-1, they're still chasing. "Listen, Conrad's made a mistake. Outfield players, they make a mistake, they've got another nine players that can help them. "When you're a keeper, it's a lonely place when you do. He's been great since he's come in, so we're not going to dwell on that too much." Falkirk manager Peter Houston said he hadn't seen television replays of the McCracken incident but again referenced the penalty awarded to Hibs at the Falkirk Stadium when the sides met in October. That game finished 1-0 after Jason Cummings scored the spot-kick - every other fixture between the teams has ended level. "I can't comment on that because I haven't seen it properly," said Houston of the penalty claim. "Over the course of the season, things even themselves out. "The only game that's been won by one of the two clubs this season was a penalty given against us and it was never a penalty. "So maybe if he has handled it - and maybe he has because I haven't seen it properly - it's evened itself up tonight." Houston was pleased to approach the return leg - in Falkirk on Friday night - level with his rivals. "One of the things I said pre-match was I wanted to be in the game going into it the second leg," added Houston. "Right away, if you go into the game and they've won 2-1, you start thinking you have to chase it early doors and open yourself up. "It's a winner-takes-all on Friday night in many ways. It could go to extra time, it could go to penalties."